Every update to Google and other search algorithms brings new ways of looking at websites - and things which didn’t exist a few years ago, such as social media indicators, are given relatively high importance in their impact on your SEO and rankings. It’s critical for recruiters to build a healthy content profile on their websites, spread out over months - ideally years - as this is a key factor that Google evaluates when looking at your site. The techniques of SEO are still valid - as long as you consider why people are looking for something, rather than just what they’re searching for. A good content strategy will answer people’s needs rather than deliver simple facts. Most recruitment businesses are looking to improve their SEO performance as it remains one of the most important aspects of attracting candidates and clients to their website. First of all, download our Recruiter’s Guide to SEO - a pragmatic step-by-step guide that steps through how to support your SEO strategy by getting your content right. How your content will effectively demonstrate your knowledge and expertise in your field. Our guide covers every aspect of content creation, from planning and production through to social sharing and analysis of its performance. If you’re not continually moving forward and improving your SEO position, you’re likely losing ground to a competitor who is. You need a solid content strategy in place to succeed in online marketing - one of the single most important components in a recruitment website's armoury. 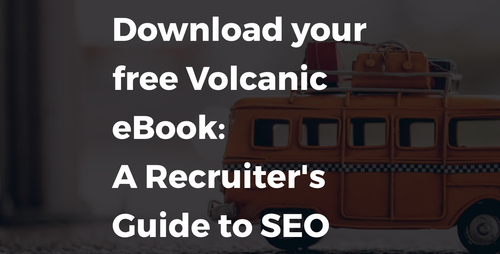 To get started, download our free Recruiter's Guide to SEO.